The Radian is a very rare thing. It’s a photography product that hit its Kickstarter funding target. Not only that but it’s now in production and available to buy. The Radian from Alpine Labs is designed to control your camera when shooting time-lapse sequences. In a nutshell it’s a set and forget device, which once programmed will trigger your camera’s shutter without any more intervention from you. 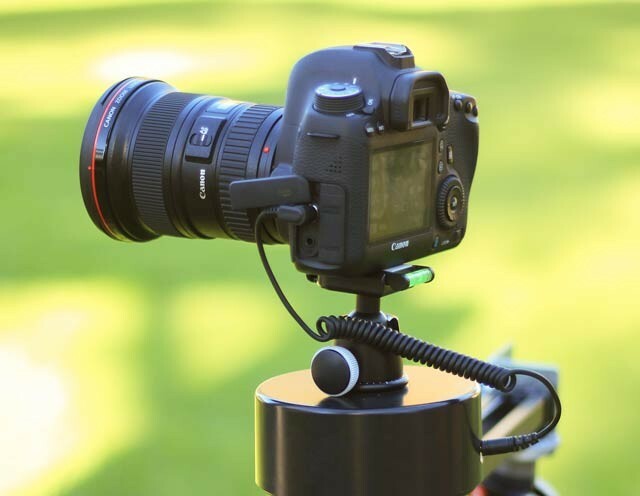 What’s different about the Radian is, as well as firing the shutter, it will also turn giving your time-lapse sequences a unique and dynamic look. What’s in the box The Radian comes with the essentials to get you up and running. As well as the Radian unit you get a cable to connect it to the remote release socket for your camera and as these vary from camera to camera it’s important you specify the right one when ordering. Power is supplied by a built in rechargeable battery and is recharged via the supplied micro USB cable or in my case, my phone charger. As is often the case you also get a sticker which I guess you can use to decorate your Radian. Not in the box but an utterly essential part of the Radian is its app. Fortunately it’s free of charge and can be downloaded from either the IOS or Android stores. 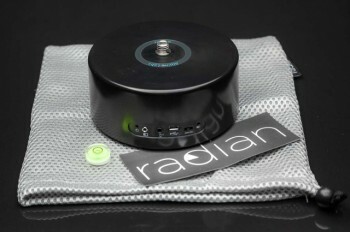 You’ll need an audio cable to move the data from your mobile device to the Radian and you’ll find that in the box too. Finally you get a protective pouch, which is always a nice item to see and a stick on bubble level. Performance The Radian is a really well designed device that is small (12cmx 5cm), light (0.5kg) and works with a long list of camera models. The unit itself has been kept thankfully clear of buttons, in fact all you get is an on/off switch, a couple of well labeled ports and two LED’s. The lack of functionality on the unit is thanks to the companion app which you use to handle all the fiddling around setting duration, interval and amount of rotation. The app will then tell you how many photos it will shoot and how long your time-lapse sequence will be once converted from stills to a video in your choice of software. You can also refer back to it during the shooting to see how far it’s got and how long you have left to shoot, which is really helpful. For the casual user like me the software is simple and intuitive. I really liked how I could make my own presets at home and then upload the best fit to the Radian once in the field. The clever design can be seen in touches such as the port that connects the Radian to your mobile is a different size to the one which connects the Radian to your camera, so there’s no danger of muddling up the cables. 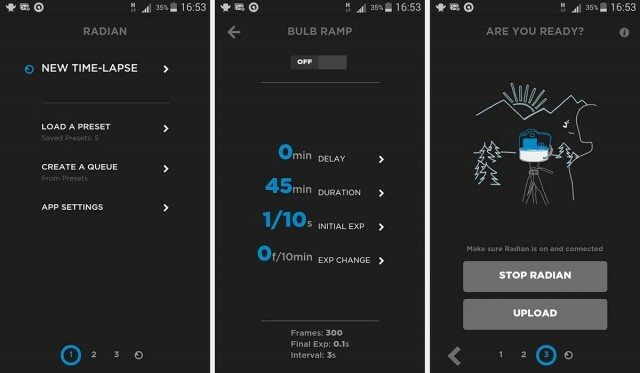 Advanced users can dive deeper into the app and set things like speed ramping and bulb ramping to add an extra dimension to their time-lapse sequences. The unique feature of the Radian however is its ability to turn as it shoots and on this front the Radian is a huge success. I’ve seen photographers claim they can do something similar with home brewed clockwork devices and whilst that might work on a GoPro sized camera the Radian will do it far better on cameras weighing up to 7Kg (15lbs). Not only that, it does it with amazing accuracy and smoothness and in all my tests I never once saw any wobble in the final sequences. Downsides The top and bottom of the Radian have standard tripod male and female threads and whilst it can sit flat on a table it’s best attached to a sturdy tripod. I tried attaching the Radian directly to my camera but ran into two problems. First it scuffed the Radian’s black plastic surface leaving a circular mark, not a big problem but annoying. The second problem is a bit more serious. Tilting the camera up would result in a time-lapse that rotated in an arc and looks most weird. For that reason I highly recommend fitting a small ball head on top of the Radian and ensuring that it’s 100% level before shooting starts. The rotation feature is brilliant but predicating how far I needed to turn the camera was a bit tricky. I often found myself over rotating, making part of my sequence unusable. Practice helps sort this out of course but I would love to see an option to spin the Radian through its programmed arc before the time-lapse starts. Maybe a future app update will add this. Conclusion I’ve only scratched the surface of what the Radian can do, for example if you add the optional L-Bracket also from Alpine Labs, you can rotate the camera vertically. Like many effects it needs to be used in moderation but even so, I’ve been impressed with just how dynamic a rotating time-lapse is compared to a static shot. 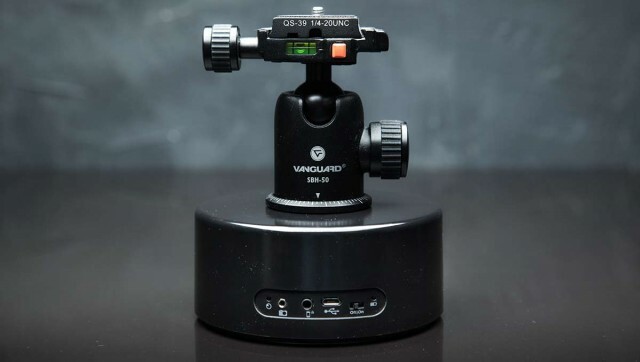 If you love making time-lapse sequences then this should be high on your wish list. 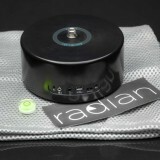 For me the Radian is now the first thing I pack whenever I’m shooting time-lapse. Would it not be better to put the Radian on the top of the ball head with the camera simply screwed on the top so the whole thing can be leveled. That’s fine as long as the camera is level but if you tilt the camera up or down and you’ll move in an arc. This product looks amazing and the fact it will rotate both directions is exactly what i am looking for. hope your still having fun with yours and i look forward to buying one myself sometime.